The Nissan Denki Cube Concept is something you've probably already seen. In fact, you probably saw it this morning when we caught the electric Nissan Cube sunning itself in advance of its press conference. What did we learn at the press conference? Fleet-use electric vehicles by 2010 and commercial vehicles by 2012. The big news is that the LA Auto Show this fall will see the introduction of the next generation Cube for the North American market. Press release, pictures of the Denki Cube and shots of two rather unfortunately customized Cubes below. New York City is about to get a lesson in what happens when geography meets geometry - specifically, when the world, which is round, meets the Nissan Cube, which is essentially square. 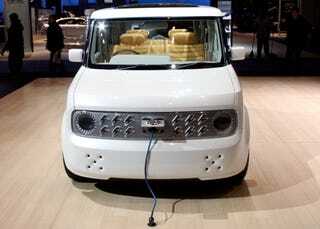 The occasion is the world debut of the Nissan Denki (Japanese for "electric") Cube Concept at the 2008 New York International Auto Show. The lithium-ion battery-powered Denki Cube electric vehicle concept, which will be on public display at the Nissan exhibit at Jacob Javits Convention Center from March 21 through March 30, was created to draw attention to Nissan Motor Co., Ltd.'s (NML) global environmental efforts. It also serves as a preview of Nissan's future small car strategy for the North American market, which includes plans to sell a redesigned gasoline-powered, next-generation Cube at Nissan dealers in the United States and Canada beginning in 2009. "The Denki Cube Concept is a fun way to expose American buyers to one of Nissan's most popular home market cars at a time when fuel economy and packaging efficiency are on a lot of people's minds," said Al Castignetti, senior vice president, sales and marketing, Nissan North America, Inc. "Like the production Cube on which it is based, the Denki Cube Concept is boxy yet charming, fashionable and functional, and completely tuned in to today's needs for enjoyable efficiency." In creating the Denki Cube Concept, the designers started with a well-defined canvas, the current-generation Nissan Cube. The iconic Cube has always been the antithesis of traditional automotive style - square, minimalist, asymmetrical and humble - yet also warm, relaxing, practical and undeniably charming. To this solid foundation, the Denki Cube adds a new EV powertrain and unique exterior and interior treatments. The Denki Cube Concept's exterior features fresh front and rear styling treatments, including a new "electric themed" front grille design with an AC power charging port, a radical "lightning" headlight design and new bumpers and turn signal lamps. In the rear, the signature Cube asymmetrical rear quarter area (with wraparound glass on one side) has been enhanced by a new bumper with hidden taillights. The roof sheet metal has been replaced with a full fixed glass panel that enhances the interior's sense of wide-open space. The Denki Cube Concept exterior also features new door mirrors and unique 16-inch wheel covers. The finishing touch is provided by a special white pearl paint and graphics. Inside, the Denki Cube Concept reflects the designers' intention of creating a relaxing, moving social hub, like a favorite room in an owner's house. Though the production Cube offers three rows of seating, the Denki Cube Concept offers only two rows and the wheelbase has been stretched 9.4 inches in order to better accommodate the lithium-ion battery cells. The newly designed front and second row seats are joined by a revised instrument panel with an IP-mounted shift button, a special steering wheel design and new door panel and cargo area trim. The biggest transformation from production Cube to Denki Cube Concept is one that isn't visible - the replacement of the standard 1.3-liter inline 4-cylinder gasoline engine with an electric motor and laminated lithium-ion batteries located under the floor and seats. The laminated structure and unique material technology offer more power, energy and battery stability, as well as compact size and packaging flexibility, versus conventional cylindrical batteries. Nissan's compact lithium-ion battery technology, one of the company's traditional strengths, provides batteries with twice as much energy compared with a conventional cylindrical battery of the same type and safer operation due to the use of chemically stable spine-structured manganese for the electrode material. In order to better leverage Nissan's lithium-ion battery capabilities, a new company, Automotive Energy Supply Corp. (AESC), was jointly established with NEC Corp. and NEC Tokin Corp. - with the goal of dramatically enhancing future battery performance and reducing battery costs. "Nissan first had an electric vehicle in the road in 1947 and has been field-testing lithium-ion batteries for more than ten years," said Castignetti. "Our ongoing goal is to dramatically enhance future battery performance while reducing battery costs." Nissan Motor Co., Ltd.'s (NML) mid-term environmental action plan, Nissan Green Program 2010 (NGP 2010), is designed to fulfill Nissan's environmental philosophy of "symbiosis of people, vehicles and nature" and contribute to a sustainable mobile society. NGP 2010 is specifically focused on reducing CO2 emissions both from Nissan products as well as from day-to-day corporate activities. Nissan is focused on three core areas related to the environment: reducing CO2 emissions; reducing exhaust emissions; and accelerating recycling efforts. * Incorporating CO2 reduction as one of the key management performance indicators. * Launch a "three-liter car" with a target of 2010; a gasoline-fueled car that runs 100 kilometers on three liters of fuel. * Expand availability of Flexible Fuel Vehicles (FFV) within the next three years. * Launch a Nissan electric vehicle early in the next decade. * Develop an original Nissan hybrid vehicle targeted for launch in FY2010. * Accelerate development of plug-in hybrid technology. * By 2010, reduce CO2 emissions from global manufacturing plants by 7% (per unit) compared to 2005. "The Nissan Green Program 2010 provides a transparent view of Nissan's future commitments to all aspects of environmental management," said Toshiyuki Shiga, Chief Operating Officer, NML. "Nissan Green Program 2010 has been designed to address immediate challenges as well as creating the foundation towards a long-term sustainable business model."